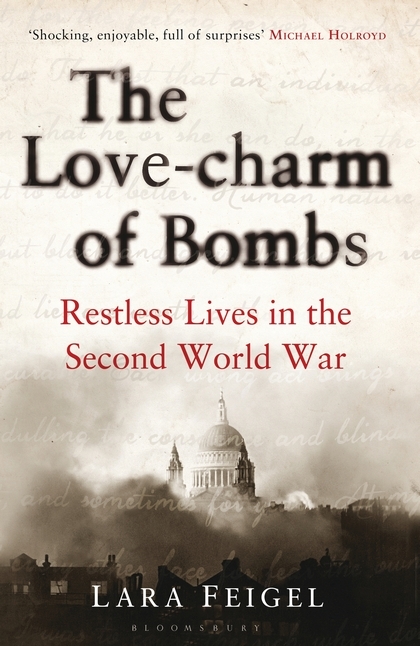 I was smitten with ‘The Love-charm of Bombs’ from the very first time I read about it. The prospect of seeing London in the Second World War through the eyes of five remarkable writers – Elizabeth Bowen, Graham Greene, Rose Macaulay, Hilde Spiel and Henry Yorke (who wrote under the name Henry Green) – was simply irresistible. And I was pulled in from the very first page, into the Blitz. I found Rose Macaulay, who had already lived through the Great War, driving an ambulance; Elizabeth Bowen and Graham Greene serving as ARP wardens – making sure that the blackout was maintained; and Henry Yorke in a team of auxiliary fireman. The picture that is painted – of dark skies, empty streets, damaged buildings – of community, fear, exhilaration, uncertainly – is extraordinarily vivid. For a moment I wasn’t sure that this was going to work – the telling of stories of real people, constructed from their letters and diaries, from the writings of their contemporaries, and from historical records. It felt strange to read that Elizabeth (Bowen) walked out on to her balcony and stretched, but I held on and soon I was caught up, in a story that reads like a novel, that sometimes spins off into history, into biography, into literary analysis. Four of the principals moved in the same literary circles – Virginia Woolf, J B Priestly, Rosamund Lehmann, Evelyn Waugh and May Sarton are among those who mix and correspond with them – but Hilde Spiegel lived a very different life. She was a wife, a mother, exiled from Austria to South London, trying to establish herself in a new world, trying to find just a little time for her writing. Her story, of which I had known nothing, was fascinating and a wonderful counterpoint to the stories of the other four. In an uncertain world, passions ran high. Graham Greene and Henry Yorke had both evacuated their wives and children to the country and both behaved as single men might, taking up with other women. Their stories seemed similar at first, but that only highlighted how different they were as they moved in different directions and revealed different attitudes. Elizabeth Bowen met Canadian diplomat Charles Ritchie who would be the great love of her life, though she remained married and he would marry another. But Rose Macaulay’s story was sadder. She lost her sister and her lover to cancer, and she lost her home, her letters, her books to a German bomb. My heart broke for her. Lara Fiegel wove their stories together beautifully. She wisely kept her style simple, focusing on the stories and the facts, her writing had exactly the right momentum, and the perspective was wonderful. I can’t quite explain it, but she brought me close those real lives without ever making me feel I was intruding. Lara Feigel’s love, curiosity and knowledge shine, leaving me eager to read more by and about all those she writes about, and applauding what she has accomplished with this book. In the end the story moves beyond the War, looking at the consequences and the rest of the lives of the five principals. The War had changed their lives and the end of the War would change them again. There is so much here, so many fascinating details that it is impossible to pick out points to focus on. This is a book that I will go on thinking about, read again, and come back to when I pick up the books I’ve been reading about. But I need to shout about it now, because it’s wonderful! ‘The Love-charm of Bombs’ has left me in awe of Elizabeth Bowen, drawn to Rose Macaulay, more interested in Henry Green and Graham Greene than I ever thought I’d be, and curious to read more about the life of Hilde Spiel. I don’t know what’s nicer: reading a book like this, or reading the books that a book like this makes you want to read next! I’d definitely like to read this — and it’ll be here in July. Worth waiting for! Definitely. it’s a book to read, re-read, pick up and put down for life – which is proabably the very best sort of book. How funny – I just, within the last fifiteen minutes, heard about this book for the first time and now here you are with a review. What perfect timing! While I am familiar with many of Bowen’s experiences during the war (thanks to my interest in Charles Ritchie), I know very little about the lives of the other authors profiled. While I don’t particularly like Bowen, Green, or Greene’s writing (I do like Macaulay), I would still be interested in hearing about their lives during the war and would love to learn more about Hilde Spiel, whose different perspective sounds fascinating. I’ve never read Henry Green, only read one Graham Greene, not read Elizabeth Bowen for years but I love Rose Macaulay. For now I’m going to give everyone the benefit of the doubt, and maybe love of the period and interest in the real life stories will hold the day even if I’m not so taken with their style. I just wanted to say thank you very much for this lovely review. It’s especially gratifying that you saw how seriously I engaged with the five writers, even when they were at their maddest and most maddening, as some of the reviewers seem to have taken a very detached tone towards them. And I’m delighted that you were so moved by their stories as well. I hope that you enjoy reading the novels – The Heat of the Day would be a great place to start, if you haven’t already read it. I so wish I’d asked more questions when my mother and grandmother were alive. They lived in London during the war years. I’m putting this on my TBR list. As the daughter of Hilde Spiel, one of the subjects of Lara Feigel’s wonderful book, I’d like to join Lara in thanking you for this appreciative, warm-hearted review. For you, Fleur, and anyone else who wants to find out more about Hilde Spiel, could I suggest reading my own translations from the German of two of her books, The Dark and the Bright – Memoirs 1911-1989, and Return to Vienna, both available from Amazon.